Isn't this imagery immense and exactly how the 'east' is portrayed in giant sweeping cinematography? I just love the marching camel silhouettes against the towering stones as a metaphor for time. 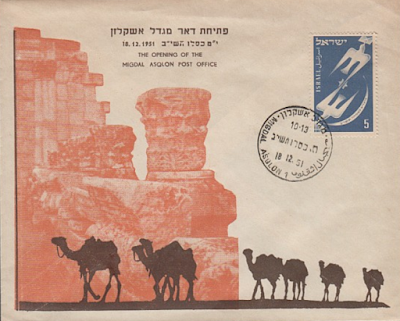 This cover was produced for 'The Opening of the Migdal Asqlon Post Office on December 18 1951. Can the background ruins be found in Ashkelon National Park?